Laurie Reynolds, Managing Director Aquamatix (left) with James Taylor, Strategic Manager Basingstoke Canal and John How, Volunteer (IWA & BCS). We are pleased to announce that an exciting new project to help manage water on the Canal has commenced. Work has being going on this scheme for some time, and will start to bear fruit during 2015. John How, a member of the Society and IWA has from the beginning led this project, which is a partnership between the Canal owners, the Canal Society and Aquamatix. A press release from Aquamatix is below. We will keep you informed how the project is getting on. The technical term for the equipment being supplied is telemetry (literally, remote measurement), however is not the snappy name we would like to give this project. We are therefore looking for ideas for a project name that would convey its purpose but also trips easily off the tongue. Suggestions please to me, Martin Leech. The Basingstoke Canal has contracted with Aquamatix, pioneer of the Internet of Things in water, to provide real‐time monitoring and control of water resources, to allow the public to access information about the canal, and to reduce energy consumed by canal operations. 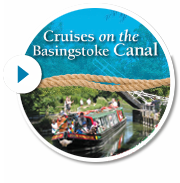 The Basingstoke Canal was built in 1792‐8, and is now a leisure facility serving the community from the River Wey Navigation near Woking, 32 miles to Odiham in Hampshire. In order to use a limited water supply as efficiently as possible while reducing the energy consumed in managing the canal operations, leading edge technologies from the Internet of Things will be supplied by Aquamatix. The system will provide a variety of tools for canal rangers to monitor water levels and flows and pumping station activity. Information from the system will also be available to the public via a website, allowing canal users to better enjoy and understand the canal and its environment. The Basingstoke Canal is jointly owned by Surrey and Hampshire County Councils. The Basingstoke Canal Authority (BCA) manage the Basingstoke Canal as a maintaining agent on behalf of the two County Councils and six riparian Borough and District Councils. The BCA has no legal or corporate identity itself and the staff of the BCA are employed by Hampshire County Council on behalf of the partnership. Aquamatix, based in Redhill, Surrey, is pioneering the Internet of Things and new wireless sensor networks in the water industry. The Internet of Things (IoT) refers to the connection of real-­‐world devices using standard protocols, allowing monitoring and control of a wide variety of assets, systems, devices or ‘things’. Aquamatix’s WaterWorX™ platform combines real-­‐time measurements and performance data with asset and GIS data to gain knowledge and understanding of asset condition and system performance. The insight gained can be used to optimise new investment to balance capacity, obsolescence, demand and risk.